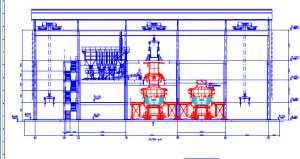 Energy optimizing furnace (EOF) is a primary steel making furnace. This process was developed by the mini steelworks pioneer Willy Korf along with his colleagues. This process is presently being operated in India at JSW SISCOL plant and at Hospet Steel plant of Mukand. The first unit went into production in1982. 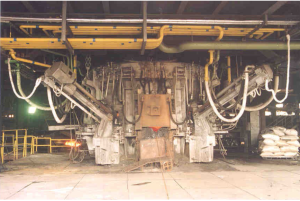 EOF is a melting/refining furnace for the production of liquid steel. It is having a scrap preheater. 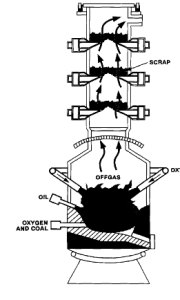 The basic principle consists of working with combined submerged and atmosphere oxygen blown in an initial charge containing hot metal, preheated solid scrap and fluxes for slag formation. Scrap is preheated to around 850 deg C by the sensible heat in the off gas in one or two chambers located above the furnace roof. Blown submerged oxygen reacts with the carbon from hot metal and generates CO bubbles that travel through the liquid bath to the furnace atmosphere. Here CO is burnt to CO2 by the oxygen blown through atmospheric injectors and supersonic lances. The bubbling of CO generates a very strong stirring and increases greatly the bath surface. This allows transfer of a good amount of heat to the bath. The process also constitutes deslagging and formation of the secondary slag. i) Chemical energy released due to the exothermic reactions between the injected oxygen and the various elements in the bath including added carbon. ii) Chemical energy released from the gaseous oxidation reactions in the furnace atmosphere involving CO and H2 released from the bath. In EOF all types and qualities of steels can be produced. The tapped steel is having similar chemistry as been obtained from combined blowing steel making process. Due to the continuous deslagging during the process good amount of dephosphorization (up to 0.008 %) and desulphurization (Up to 0.025 %) is achieved. Since EOF process has a high percentage (greater than 60 %) of hot metal in the charge, the tapped liquid steel has a very low content of tramp elements. This is of advantage while producing special steel grades such as die forging steels, special clean steels and steels for seamless pipes etc. The high partial pressure of CO during the whole blowing period results to very low nitrogen and hydrogen levels in the tapped steel. In case of high quality and special steels tapped liquid steel is treated in secondary steel making units as per need. Total height from working platform to top level is about 17 to 25 m.
Tilting angle for tapping and deslagging is up to 8 deg. The schematic diagram of an EOF is given in Fig 1. Bottom exchange (between campaigns): – 12 to 24 hours. EOF is having the following major equipments/components. Two numbers bottom cars of shuttle type are used for quick bottom change during a new campaign. One bottom car carries the the EOF in operation while the second car carries the other bottom and is parked for relining at one or other side of the bottom under use. Both cars are equipped with roll collar tracks to tilt the furnace for tapping or deslagging. Tilting is performed by high speed hydraulic cylinders. This allows slag free tapping. Energy optimizing furnace is equipped with bottom refractory lining, split water cooled shell, water cooled roof, sealing between the furnace and scrap preheater, hot metal launder, steel tapping launder, submerged tuyeres, atmosphere injectors and supersonic lance for oxygen blowing, oxy-fuel burners for heating-up new bottom. Scrap preheater placed immediately above the furnace is provided with water cooled tilting fingers to support the solid metallic charge which is heated by the furnace off-gas. At the time of scrap charging, the fingers tilt and release the preheated scrap into the EOF bottom. Water-cooled inclined chute is also provided below the fingers for additions into the furnace. Other components of an EOF are air injectors for post combustion of carbon monoxide, water sprays to control the off-gas temperature before the scrap layer, off-gas uptake, water cooled sliding door and scrap charging system both placed at the scrap preheater top. A view of the EOF from the working platform is shown in Fig 2. Scrap preheater is an essential part of the EOF and is provided with one or two layers of water cooled fingers on which cold scrap is placed. Hot off-gas evolved from the EOF flow through the scrap and heating it up to 850 deg C. The fingers are tilted for dropping the scrap into the furnace. Process flow of the EOF process is at Fig 3. There is a wide flexibility with regards to the metallic charge mix. The advantages are more when hot metal availability is less say 50 % from the iron making process. There is flexibility also with respect to solid charge (scrap, pig iron). The process is advantageous in case of low availability of electrical energy. The liquid steel has low content of tramp elements. The tapped steel can be directly transferred to the continuous casting machine or can be sent to secondary metallurgy units. 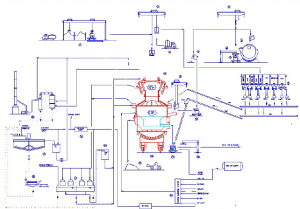 EOF has simple process control and can be fully automated. The process is energy efficient. The process works under slightly negative pressure hence there is hardly any dust emissions. There is low noise level. Flexibility with respect to solid charge materials (scrap, pig iron) is another attraction. Well defined and it is great for flexibility and order based heats to service. Hope, no quality control issues. The Schematic (Fig.1) shows the the taphole below the bath level requiring plugging. Your text mentions that tapping is done by tilting the furnace bottom. If so, the tapping launder should be above the metal line. Would be grateful if you please clarify. What will be connected power required for a 30t EOF and can it be compatible with a 250 Cu.M MBF to produce steel billets from the Molten Pig Iron from the MBF. specific Power requirement is in the range of 45 to 50 kWh/ ton of liquid steel and specific hot metal consumption is in the range of 800 to 900 Kg/ton of liquid steel. The connected power will be around 3 MW. I have send u a message regarding my project of 350 Cu.M MBF and 30T EOF 30T LF please revert back me asap. How to make slag fomay sometimes very difficult to flushing slag.